Yes, now it can be told! 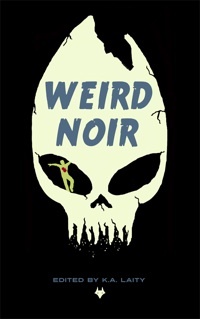 Coming very soon (as in, we’re rushing as fast as we can) from Fox Spirit Books is this fabulous new collection WEIRD NOIR! Dig that awesome cover art from the amazingly talented S. L. Johnson (AKA the Queen of Everything). It’s been tough sorting through the story submissions; some terrific stories that just didn’t fit the umbrella and some stories that just didn’t work for me. Each editor has their own tastes and pleasures, so this topic in other hands might well have come out differently. I kind of hope there will be other anthologies in a similar vein — we need more weirdness and more noir! Here’s the table of contents: you’ll probably recognise some names — I wasn’t about to try something like this (however much Adele supported me and thank you for that, my friend) without a few ringers I could pester for a story. But you’ll likely see some names you don’t know — either folks who are newish to the writing game or folks who regularly work in another genre. Some people found themselves surprised by the twists their stories took. I was delighted. The tales veer from darkly horrific to wickedly funny (sometimes within the same story). But they all groove on the noir aesthetic and they’re all weird in some way: some subtle, some broad, some magical, some uncannily horrifying. I may play with the running order yet, but I think I have it sorted so each story surprises. Thanks to Adele, Stephanie, Daz (in advance, as I know your hard work in the copy editing is just beginning) and all the writers. Chuffed to be on board for this, K – what a great selection of writers! Only because of you, Mr B.
Glad to have you on board, monsieur! Thanks! These stories were a joy to read. Love this! Line up looks awesome. So very excited!